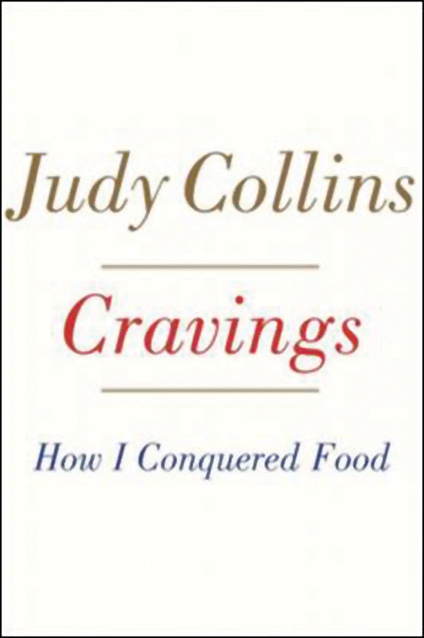 A new book by folk singer and author Judy Collins reveals all about her battle with food. Leonard Cohen is dead. Joni Mitchell is ailing. Judy Collins stands out in the crowd of ’60s folk artists as blooming. I recently caught her concert at the Metropolitan Museum – her skin glows, she wears high-heeled boots, she plays guitar and piano (and makes you realize what a classical pianist the world lost when, at 15, she turned to folk music) and her voice is as pure as the driven snow. The secrets are revealed in her book, Cravings: How I Conquered Food, a frank account of how she overcame compulsive overeating and dieting, and the journey that led her to a solution and good health. Some of the material will be familiar to readers of Collins’ memoir, Judy Blue Eyes, in which she wrote about, among other things, her battle with the bottle. Drinking to excess was something Judy inherited from her father who was charming but could be terrifying when he was drunk. Now free from her dependence on alcohol, Judy reveals her almost daily struggle with food. “I have been sober for 38 years now, and I do not have to drink alcohol. But three times a day, I still have to face food. How to do that has been my lifelong struggle. The fight is over and I want to share how that happened,” she says of her reason for writing the book. We meet, at my suggestion, at a restaurant, primarily know for its meat, on the Upper West Side. (Born in Seattle and raised in Colorado, Judy has been a Manhattan resident since the early ’70s.) Judy’s having iced tea. I’m having wine. We are both having burgers, except mine has a bun and hers doesn’t. And reckoning that it’s at least eight ounces, she just eats half, while I eat mine whole. “Exercise, along with a diet free from sugar, grains, flour, and junk is the secret,” she says leaning over across the table towards me. Though she was never noticeably overweight, Collins estimates she has lost “at least a thousand pounds” in her struggle to keep the weight off. Nothing seemed to stop her cravings for certain foods until she started to relate her problem with food to her problem with alcohol, and began to see her cravings as food allergies. Once Judy cut the “allergy” foods from her diet, her cravings disappeared and she’s maintained a healthy weight for 18 years now. Gigi, a friend who has struggled with her own weight for ages, read Collins’ book and it struck a chord. “It’s the first book on food that made sense,” she told me. She has begun to follow Judy’s advice and it’s working. And besides, “[the book] is a bloody good read,” says Gigi. I can only concur. In between chapters on her life, and eating disorders, and the many diet gurus she encountered along the way, Collins profiles some well-known fellow “obsessives” who struggled with their weight. We learn, for instance, that the poet Lord Byron was said to have been anorexic, as well as bulimic. Very interesting. However, it is her treatise on William the Conqueror that grabbed my attention. It turns out that William, known for launching the Norman conquest of England, had a serious fight with his weight. When he became too fat to ride his horse (and those horses were bred to carry enormous weight) his answer was to lock himself in a room and just drink liquids – beer, wine, and milk (“water wasn’t good in those days,” Judy says). The liquid diet worked, enough that he could mount his horse, but alas his stomach still protruded. When his horse stumbled, he was thrown forward onto the pommel of his saddle, and his internal organs ruptured. That was the end of William. Judy herself drinks a ton of water, “probably sixty ounces or more a day,” she says. “It’s the source of life, the essence of fifty to sixty-five percent of our bodies.” Her parting words to me are something I’ve taken to heart. “The next time you are exhausted and feel like you need a sugary drink, try a glass of water. You are just dehydrated,” she advises. Loved your article, thank you.